[Original Post]:Basically, as the title says. I guess that the latest update which fixed the helmets having their own channels made this an issue. 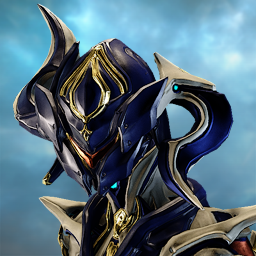 What I noticed is that both, Frost Prime and Mag Prime helmets have the old outdated darker blue on their helmets energy colors, as opposed to the brighter/Orokin blue used in the default tints of their bodies when the new default option was introduced. So it looks weird, bad, and outdated... I'll post pics later to better show the issue. 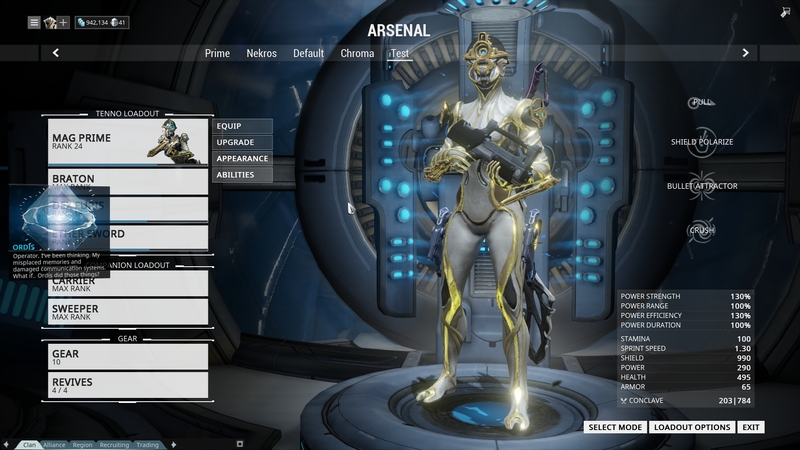 Also, while the issue is noticable on Mag/Frost, I suspect other Prime frames might have this (Excalibur, Rhino, etc). Little bump: Noticed it happens in all Warframes. Nova (default) has a brighter blue color on energy in her body, but the helmet looks like the old outdated dark blue color as well. Ash's energy helm is a whole different color. Uploading pictures right now for comparision. As I stated, this is because the helmets are copying the palattes from the frames, and older frames, when using that option on accessories, copy the old energy c0olors since those were not updated. Moving over to Art/Animation Bugs. Thanks for reporting! It's been awhile that this bug appeared and I think it's due to the new default color system (showing default colors as transparent on UI). 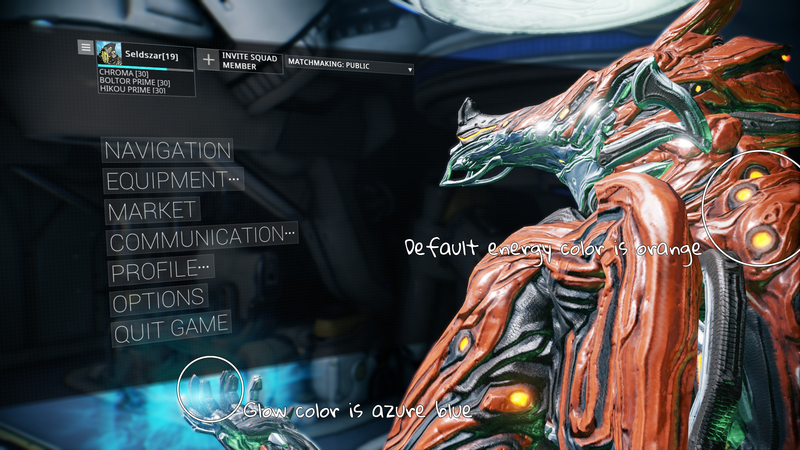 When we set colors to default, the energy color on Warframe helmet is different than the body. 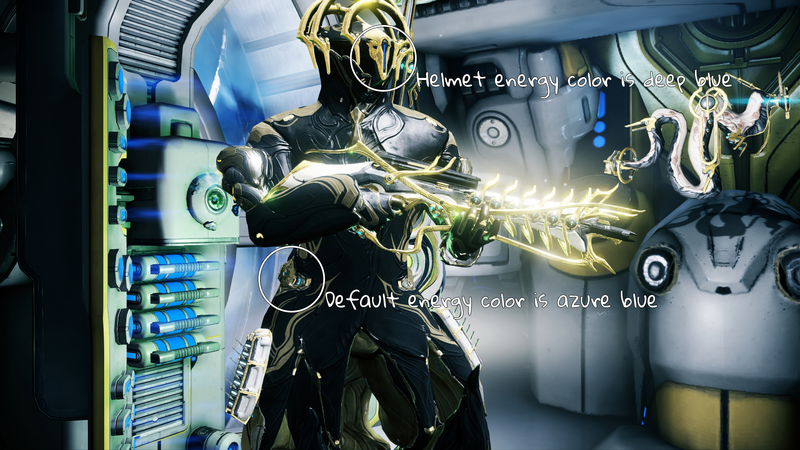 For example, Rhino Prime default body energy color is now azure blue but his helmet is still deep blue. Same bug for Frost Prime and maybe for others dark primes. But it's not the only problem, on some Warframes (maybe all? ), the color when we using an ability is azure blue while his default energy color is different. For example, I use Chroma with his default energy color, orange, but when I deploy my effigy, his wings are azure blue. Yes! Someone else noticed! I'll let you know why. A few patches ago, the default colors feature was added. With that, Helms did have their own color channels, just like accessories. What that means is that they had them non selectable for us, the users, but they went to default when pressing default and copied the tint color assigned if those were changed. The feature, though, made the helms not copy the main colors on Prime helmets. So someone reported it on the XONE Message Board, and Megan logged the issue. Patch 16.8 fixed it on PC, by making the helms copy the color channels, just like in Syandana's. This comes with an issue, however. 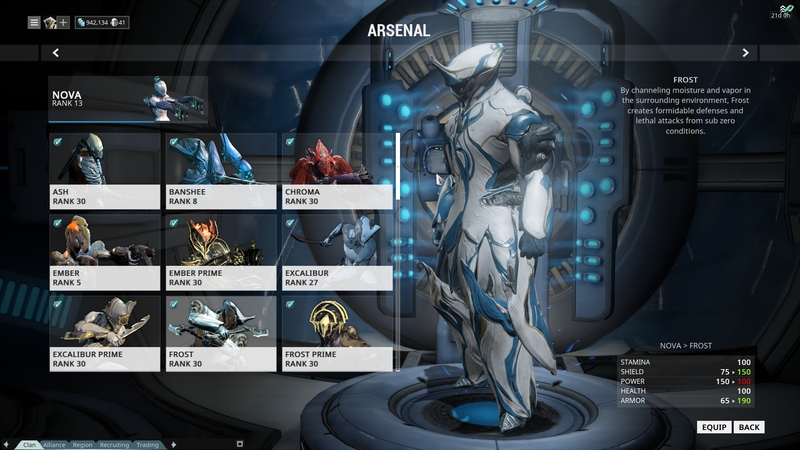 All the color profiles prior to Limbo got updated. And that includes energies. All frames had their energy lighter, from Mirage to Excalibur. But the tints themselves, when you copy them to accessories WERE NOT updated. 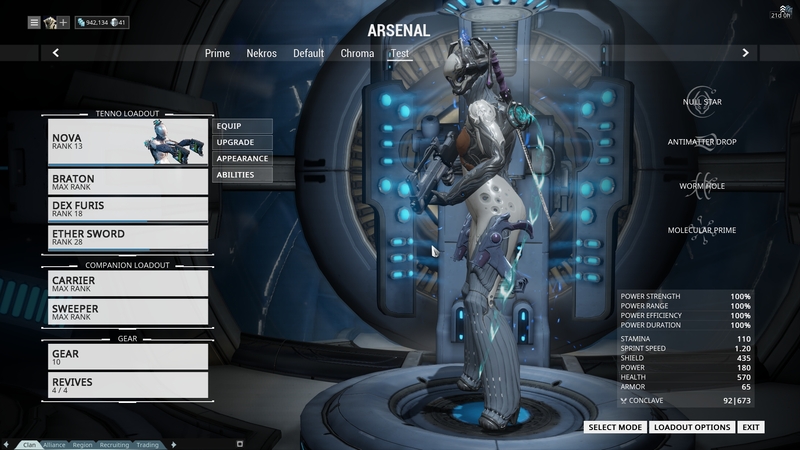 You can try putting a Syandana on Frost, Frost Prime, copy colors, and see that the energy color is the old outdated blue. 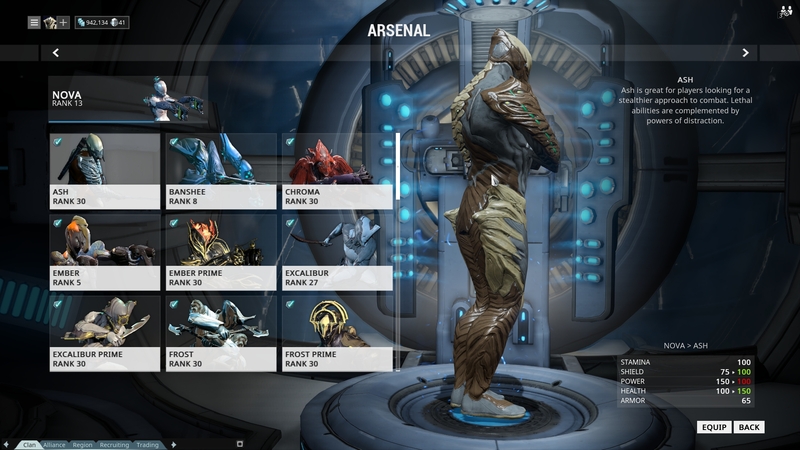 a) Add a feature to the UI so we can customize helm colors by themselves (which would be best, since Trinity's helm should be red in energy). (Long term solution, gets rid of any issue for ever more). 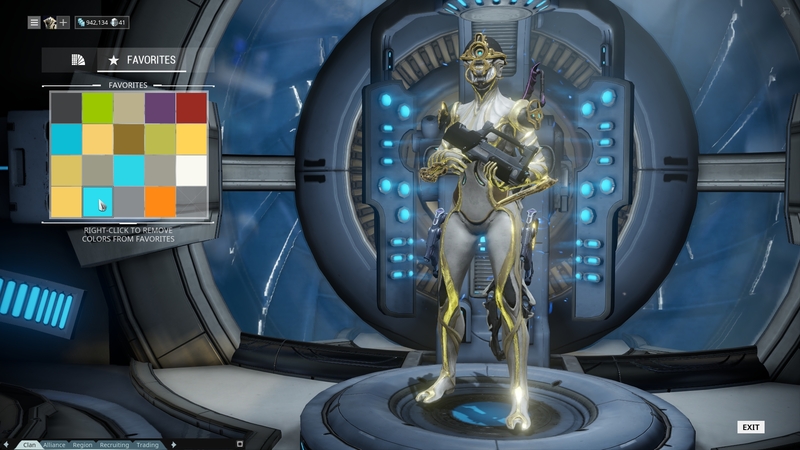 b) Update the Tenno Color pallette and ALL profiles prior to Limbo/Nyx Prime, so they match the intended colorations. (short term solution till UI can be adressed, needs to be fixed anyways due cosmetics energy colors being not the same). Also, on the subject of energy glow, it's way more extendable, Channeling is Orokin blue on all frames in Default colors, and some abilities make no sense (Chroma's effigy makes the Dragon form have blue wings). Bumping this, although Rebecca merged the threads and most likely reported the issue (thanks!). I've been thinking as well for option that could allow the helmets retain default (blank) tint if we choose to, but also let colors be copied (in case you use alt helmets on a Prime) so the uniqueness of Ember Prime and Trinity's helmet can be preserved without affecting people that want alternate options. Perhaps a copy main colors to helmet, or copy energy colors to helmet button on the Appearance UI? So it's easy to add and shouldn't be much of a hassle. Looks like Loki/Prime PBR textures did fix this for that very frame, but the rest still have this issue. So bump. (Besides, waiting for each frame to be individually PBRd means it will probably take a whole year before this is fixed). Also, Channeling Effects seem broken as well. Seems the gray color profile is affecting them on default, which means all default colored frames have gray energy patterns when channeling. Parkour effects do also look different, although in default Excalibur blue fashion. EDIT: I'm uploading videos to better show the issue. i got that too with limbo. i colored him with little blackish blue just to see how the colors go with his energy color and then when i return it, it stayed like that. i really want my icy light greenish blue for his energy color back. btw i had to put icy light blue color for his energy to look little similar for the sigils. and here is my problem with colors which is the same as this one. 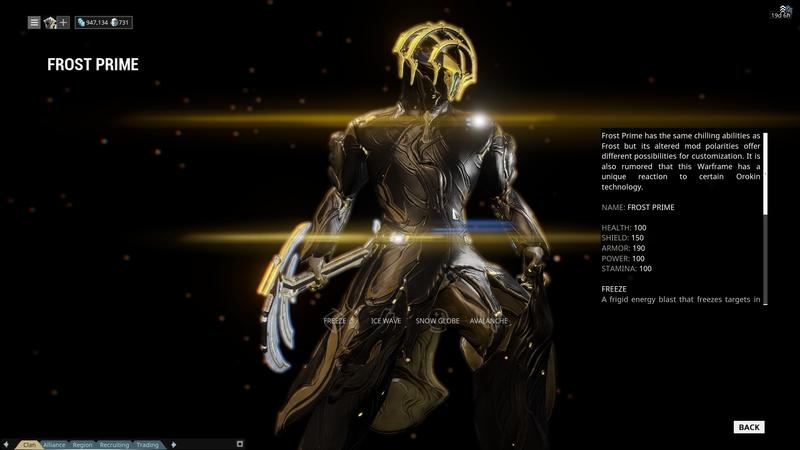 -RHino/Prime -> CHanged energy from blue (check Rhino Prime wallpaper) to bright greeny-blue. Also, the weapons need the accessories colors to be updated as well. On the channeling effects issues, I have an idea. It's tied to the copy colors when set to default bug, that makes them all gray/white (since that's what's copied unless you re apply them), but if we changed them to standard frame blue, we could have all channeling effects on default energies to be blue. 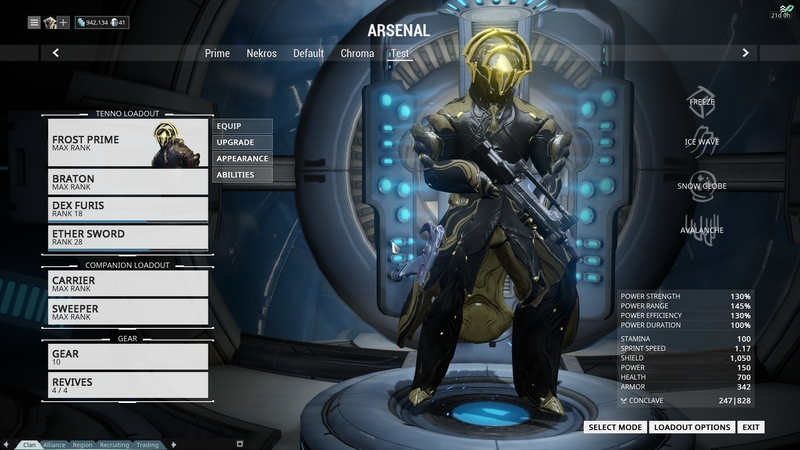 Excalibur has still some stuff but I want to see what Excalibur's Immortal and Proto Armor skin look like when PBR'd though, since we could destroy the intended look for the frame. Also, I'm still wondering what can be done for Trinity/Prime's screen to keep the intended red color without messing the blue (default)/orange (prime) energy color on the rest of the body. New patch, new color profile update. 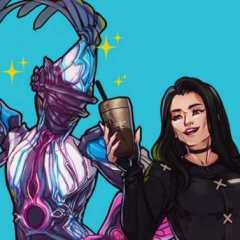 Saryn's been corrected on her default skin. Going to make a list on the first post for the sake of clarity as well.